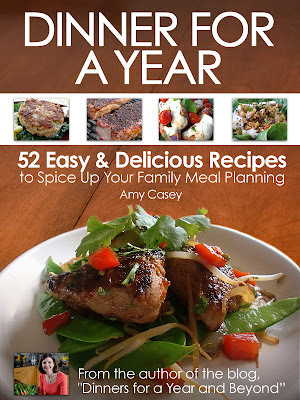 Dinners for a Year and Beyond: Presenting my new cookbook.... Dinner for a Year! 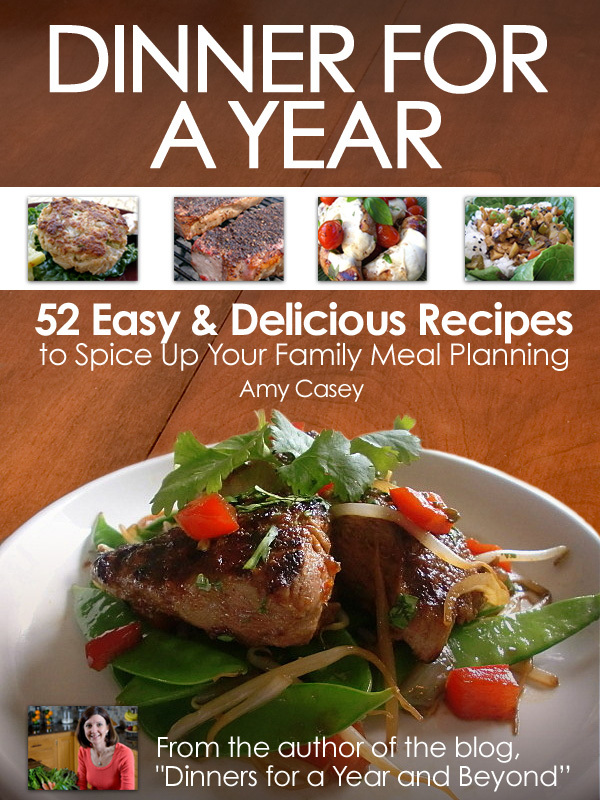 I am so excited to announce that my new cookbook Dinner for a Year 52 Easy and Delicious Recipes to Spice Up Your Family Menu Planning has been published!! After many years of gathering my dinnertime recipes in binders, cookbooks and on my blog Dinners for a Year and Beyond, I have published my cookbook to help you add a little zip and zing to your weekly dinners. Like most home cooks, I can fall into a rut of making the same dinners day after day and week after week. I decided to shake things up a bit by adding 1 new recipe a week to my dinner menu plan. It did not take much thought with all the amazing recipes floating around the internet, in magazines, in cookbooks, and in my head. It also did not take any more time as I was going to be making dinner for my family any way so why not spice it up a little bit. So how will my new cookbook Dinner for a Year help you and your family??? Well, I have done the work of choosing one new recipe to add to your menu planning each week. The recipes are not difficult. They all use ingredients you can find at your local grocery store. And they are unique and will appeal to all memebers of your family.I arranged the recipes in the cookbook by the seasons to highlight the best ingredients available throughout the year. The recipes fit into our eating styles at different times of the year with grilling recipes for the summer months and comfort food recipes for the winter months. I added a bonus chapter with 10 of my favorite desserts because no meal is complete without a sweet ending. Also, I will be offering personalized and signed bookplates to download into your copy of Dinner for a Year in the near future. If you would like to have your copy of my cookbook signed just email me at amy@amycaseycooks.com and I will email back your bookplate to download in your copy as soon as it is available. Congrats! It looks like a great book! Congratulations on your cookbook! I certainly will be checking it out, and when I do purchase it I want a signed copy. I am writing a cookbook, but it is for my two kids so they can prepare the traditional recipes from both sides of my family. I think that is the best gift I can give to them. BTW, I discovered you by searching for a peanut butter bread recipe! It’s a must buy book! It’s definitely perfect for bakers, mothers, grandmothers, and soon to be moms. I would gladly recommend that to my friends and relatives. Keep up that passion and determination. I admire your spirit towards your interests. Have a happy weekend to you! God Bless and Ciao!